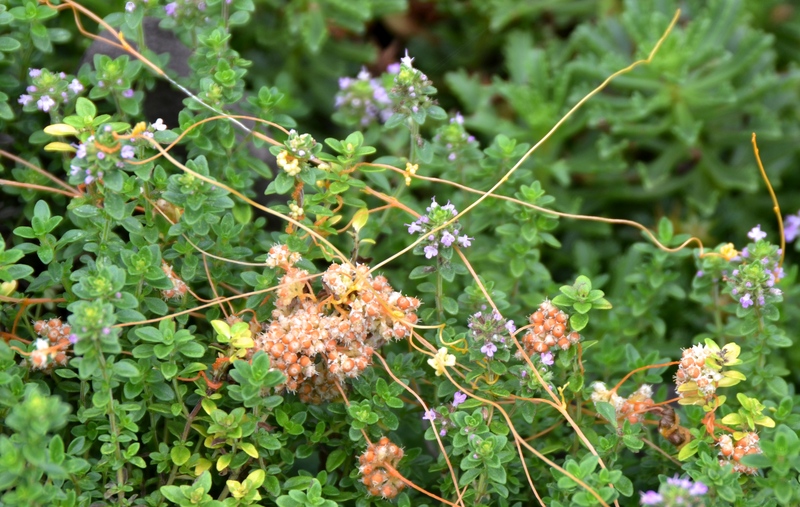 The orange wiry stems of the Dodder are attached to the Thyme plants at multiple points. I found an unusual plant called Thyme Dodder (Cuscuta), in the Sunset Garden today. 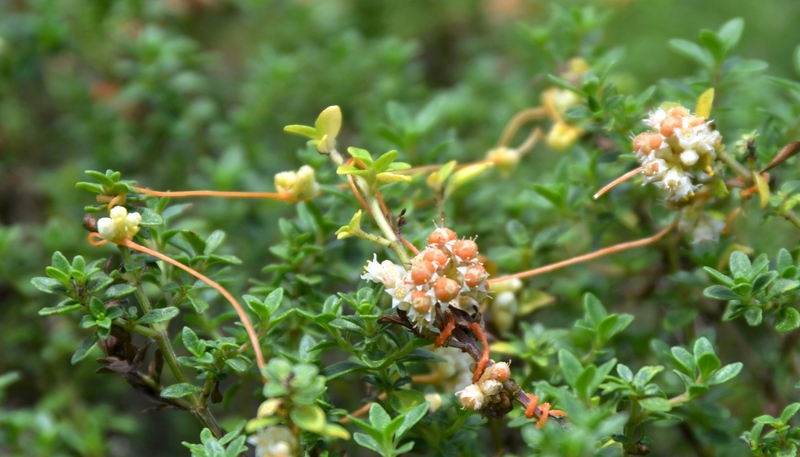 It is a parasitic plant that has no chlorophyll and so relies on getting water and nutrients from its host plant, which in this case is a thyme. I remember this plant from childhood holidays at an English pebble beach in Kent, in the aptly named seaside village of Greatstone. My Dad is a Botanist and we would go on walks to look at plants. The shingle ecosystem on the beaches of Greatstone and neighboring Dungeness, are known for their highly adapted flora. With high levels of salt and pebbles that drain water away very quickly, these beaches are a tough place for plants to grow. The dodder was growing on Broom plants on the shingle banks. Interestingly, the Dodder in my garden is in the Sunset Garden that is mulched with pebbles, in a similar way to the shingle beaches. Dodder is generally an annual that grows from seeds that are viable for years in the soil. The young plant has a few days to find a plant to parasitize otherwise it will die. If a plant is found to parasitize, the orange stems of the dodder wind itself tightly counter-clockwise around the host stem. The strong but slender dodder stems make a very close connection that then punctures the host stem, using a structure called a haustoria. The parasite does not kill the host plant, but weakens it by removal of nutrients, or by the blocking light needed for photosynthesis. The parasite is called “Dodder”- maybe named after to old word – to dodder – or tremble. The slightest breath of wind makes the wiry stems of the dodder plant wiggle in the breeze. Dodder is mentioned in the old herbals as being beneficial for “cold greefs”, “trembling of the heart”, “fainting and swooning”. I would not try any of the recommendations as it may make you faint and swoon more. What am I going to do about my weird and fascinating parasitic plant? My Dad says, keep it so that you can study it, or failing that, pot up a thyme and its attached Dodder and keep it in isolation. I think that it has to come out before it sets seed; both the thyme and dodder, but maybe a little pot to look at. If I leave it in the ground I might be finding its progeny attacking my thyme plants for the next few decades. The Archers Gold thyme plants are about six inches tall. They form a fragrant carpet in the sunset garden. 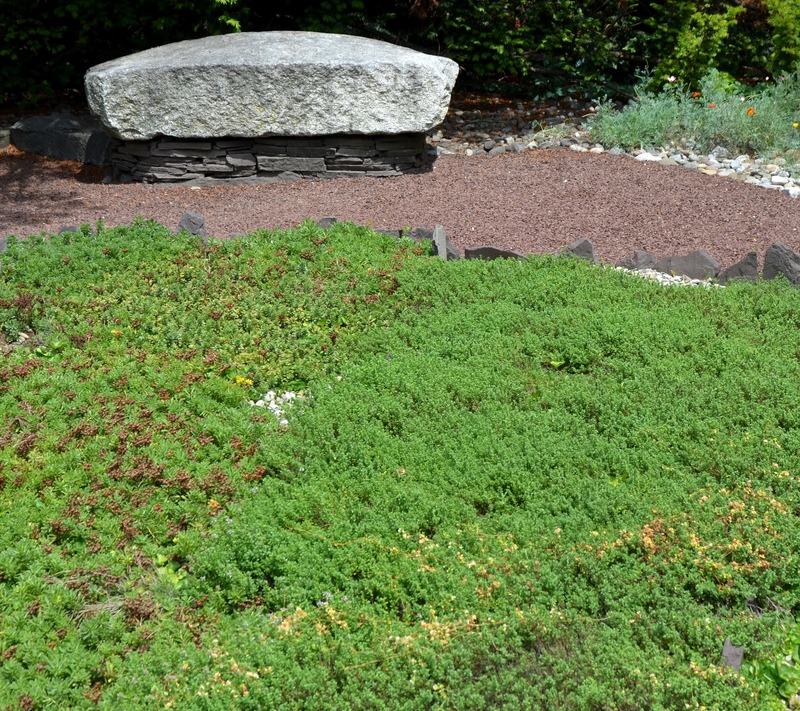 (Thyme Dodder is bottom right of photo). 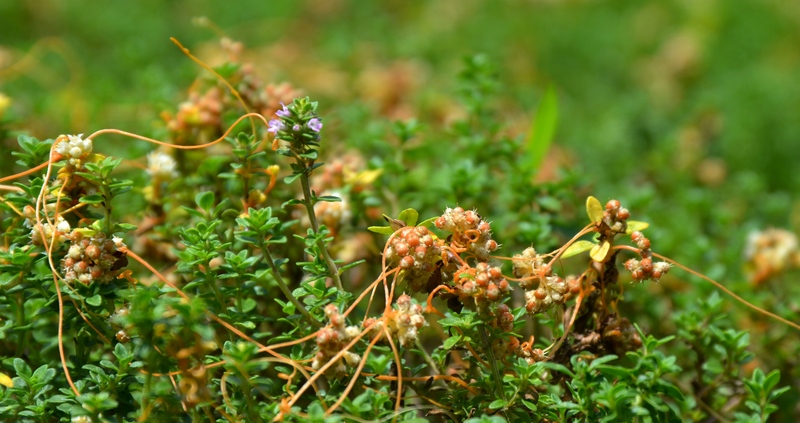 Thyme Dodder punctures the thyme plant – its unwilling host- using an attachment structure called a haustoria. It taps into the thyme stem and extracts water and nutrients. Close up view of the developing seeds. Dodder has a five petaled white flower that is said to be fragrant in the evening – note the purple thyme flower. I am more familiar with the dodder that winds itself around nettles, but glad to know about this and see the flower. I love this blog! Yes, the dodder is often found on nettles in the UK. My Dad found a good patch this summer on nettles. In America we do not have many nettles, just in some locations. I have found that many people have no clue what this plant is. Check back because I will post about a parasitic plant also.